Three flights and 48 hours later, we are in Sandakan, Borneo. We stopped for a night in the capital, Kota Kinabalu, on the west coast, but just at the Hyatt, so that we could enjoy a night’s rest, good food and some play time at their lovely pool overlooking the South China Sea. For our first full day on the east coast we are in Sepilok, to visit the Orangutan Rehabilitation Center. We went for the 9:30 am feeding, but only one young Orangutan came out to have some fruit, along with five or six macaques. The macaques crawled along ropes hung among the trees to reach the feeding platforms 10 or 15 feet above the jungle floor, but the Orangutan just strolled up the ladder like any human would have done. Then he or she hung upside down from one rope while eating a banana. The crowd, gathered along the boardwalk with cameras and binoculars, suffering through the 40 degree heat and unbelievable humidity, gasped and laughed. This is what we all came here to see: wild orangutans playing in the trees, giving us a glimpse of how beautiful and graceful they are, before disappearing back into the dense trees and vegetation to whatever mysterious and mundane activities they usually engage in. And our young Orangutan did just that. Rowan was an trooper, waiting out the heat and the posted requests for silence with tremendous patience, with only a few (quiet) outbursts of ” I’m hot, let’s go look at the birds, mamma”. 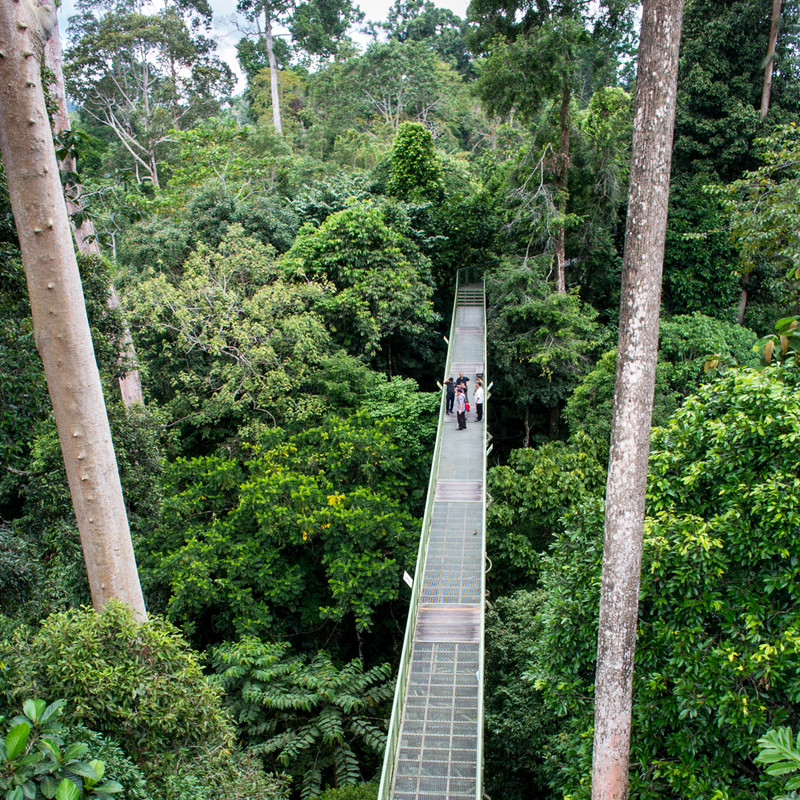 So we went to the Rainforest Discovery Center next and walked the paths that took us high up into the canopy of trees for bird watching. 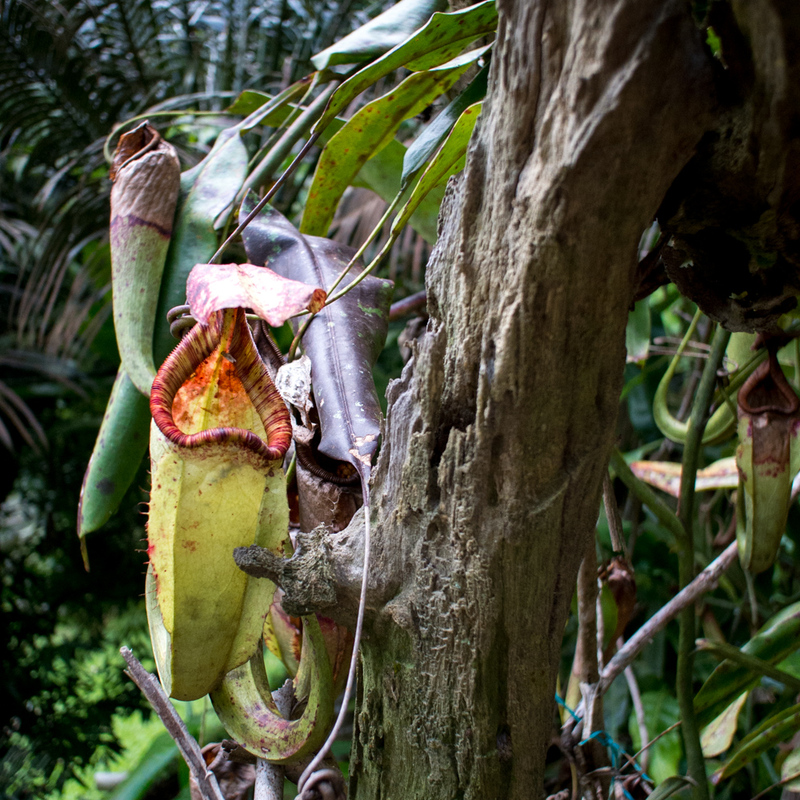 We didn’t see any, but we did see some amazing trees and plants that made us feel like we had wandered into a Jurassic Park movie, partly because of their sheer size, and partly due to their lushness. Everything is so green and abundant, the variety of plants and trees is incredible and my eyes kept moving from plant to plant, leaf to leaf, wondering how something that lives on the same planet could be so huge and bizarre. We came back to our hotel, the Sepilok Jungle Resort, and napped before heading to the pool. Rowan spent most of his time sliding down the gullet of a super sized grey-blue fish into my arms in the small circular kids’ pool. When we made to dry off and leave, we saw an Oriental Pied Hornbill swoop across the sky, it’s long black wingtips stark against the blue sky, it’s thick, white curved bill pointing its journey across the forest from one giant tree to another. We are reading your posts with a great interest. This one about Orangutan Sanctuary really excited all of us. Your description of rainforest and Orangutan feeding is so real that Zdenka, Peter and I felt like we were there together with you. Glad to hear that you are getting used to heat and humidity because Perth temperatures are going to soar to mid 30ies beginning of next week. Mind you, it is dry heat, so you will feel much more comfortable. Enjoy the rest of your Asian tour! See you soon in Perth!